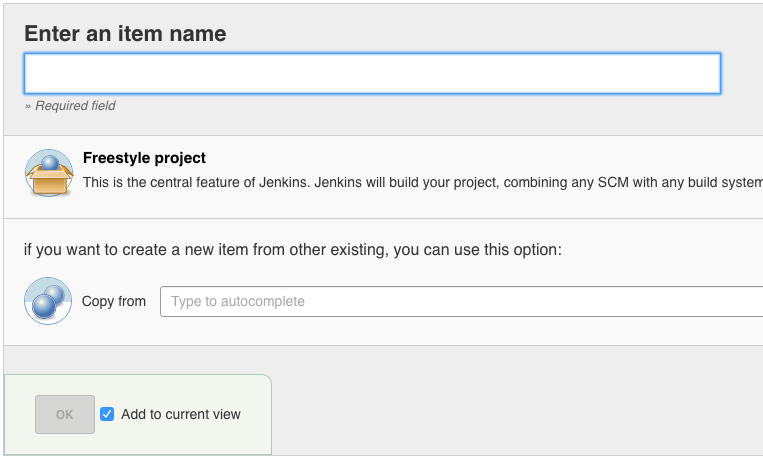 This adds a checkbox in the new job screen, allowing the user to control whether the job will be added to the current view. what if the current view is based on a regex filter? If a regex is set then the checkbox will be unticked by default (see isAddToCurrentView method), unless if there are also jobs added through jobNames. Naming of the file is inconsistent with the vast majority of existing Jelly files. ~1/6 have dashes, about half of them to separate a prefix (config-) from the rest. Almost all others are lowercase or camelCase. Underscores are only used as prefix (e.g. _api.jelly). I therefore recommend something like newJobButtonBar or newJob-buttonBar. I'm not sure I find the rule of checking/unchecking by default is definitely the right one. But as I can't come up with a better proposal, I'm fine with it. If someone finds a better way, it'll be quite easy to adjust as Vincent isolated that well in a small decision method. Also, used again docker run -ti -p 8080:8080 -e ID=2529 batmat/jenkins-pr-tester and happy to see it still works. I think the defaults here are sensible. It's definitely a major improvement over the current situation.